The Sturtevant Richmont micrometer adjustable fixed ratchet torque wrench is adjustable to a torque value by rotating the grip.This torque wrench has a simple thumbscrew mechanism that locks the handle to avoid changing torque value while in use. The fast adjustment of this Sturtevant Richmont micrometer adjustable fixed ratchet torque wrench takes the fewest rotations of any tool to reach full scale and its' ball bearing rockover assembly assures smooth operation, enhances repeatability and increases the cycle life of the wrench. At preset torque value a strong audible and tactile impulse is emitted and this torque wrench features a Neoprene rubber grip for cushioning and oil/chemical resistance. The Sturtevant Richmont micrometer adjustable fixed ratchet torque wrench includes a custom molded plastic case (250 ft. lbs./300 Nm and below). The aluminium increment band is color coded: black for inch lbs. ; gold for foot lbs. ; blue for Newton metre. The Sturtevant Richmont micrometer adjustable fixed ratchet torque wrench design is very strong and durable and features an accuracy of +/- 4% Indicated Value (from 20% to 100% of capacity) meets or exceeds ASME B107.14M , ISO 6789, and AS 28431. The 810783 Sturtevant Richmont 28-140 Nm Torque Wrench, Micrometer Adjustable 3/8'' Square Drive is one of thousands of quality tooling products available from MRO Tools. 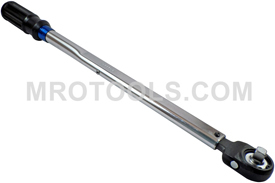 Please browse Sturtevant Richmont Torque Wrenches Discontinued for tools similar to the 810783 Sturtevant Richmont 28-140 Nm Torque Wrench, Micrometer Adjustable 3/8'' Square Drive. 810783 Sturtevant Richmont 28-140 Nm Torque Wrench, Micrometer Adjustable 3/8'' Square Drive description summary: Sturtevant Richmont metric micrometer adjustable fixed ratchet torque wrench. Model: 3 SDR 140 Nm Torque Capacity: 28-140 Nm Steps Of Graduations: 1 Nm Square Drive: 3/8'' Overall Length: 17.9'' Quantity discounts may be available for the 810783 Sturtevant Richmont 28-140 Nm Torque Wrench, Micrometer Adjustable 3/8'' Square Drive. Please contact MRO Tools for details.